Calcium is also one of the important nutrient throughout the pregnancy. In the beginning months, it is required for the development of foetal bones and teeth while towards the end of pregnancy, it is beneficial for preparing for breast milk production. Leg cramps usually experienced during pregnancy and can be due to calcium deficiency. So this section is for you to stock up on your calcium stores. Dairy products like milk, Paneer, Curd along with green leafy vegetables and a few other vegetables like broccoli spinach, mint etc are a good source of calcium. To add to the list further, sesame seeds and nachni are all a good source of calcium. 1200 mg per day is a requirement of a mother-to-be. 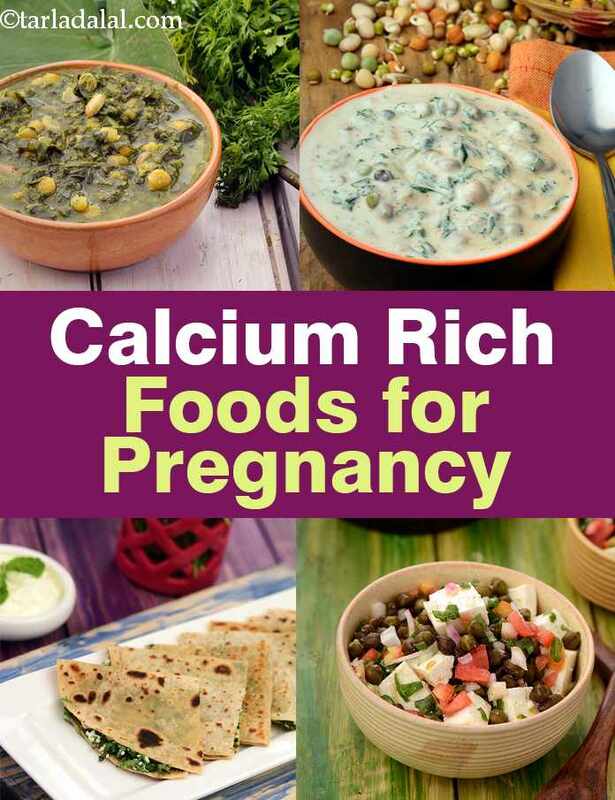 List of 40 calcium rich foods to eat during pregnancy. Have this chilled Grape Lassi when you get those hot flashes during pregnancy. Loaded with Protein, Calcium, Magnesium and Resveratrol which is a potent antioxidant and here it comes from grapes. Here is a perfect milkshake called Date and Apple Shake a lovely combination of dates and apples which is naturally sweet and this recipe is sugar free. Strawberry Chickoo Shake is just what you will need when you are too famished to cook, too nauseated to eat, but badly in need of a sumptuous snack. A calcium and vitamin C rich drink that you will relish to the last drop. Enjoy all our calcium rich foods for pregnancy and also try our other pregnancy recipe categories from the options given below. These quick and easy to make dhoklas are best enjoyed as a breakfast dish or even a late afternoon snack. Black-eyed beans, also called cow peas or chawli beans are extremely rich in iron and folic acid. Both these nutrients are required in abundance, especially during the first trimester.